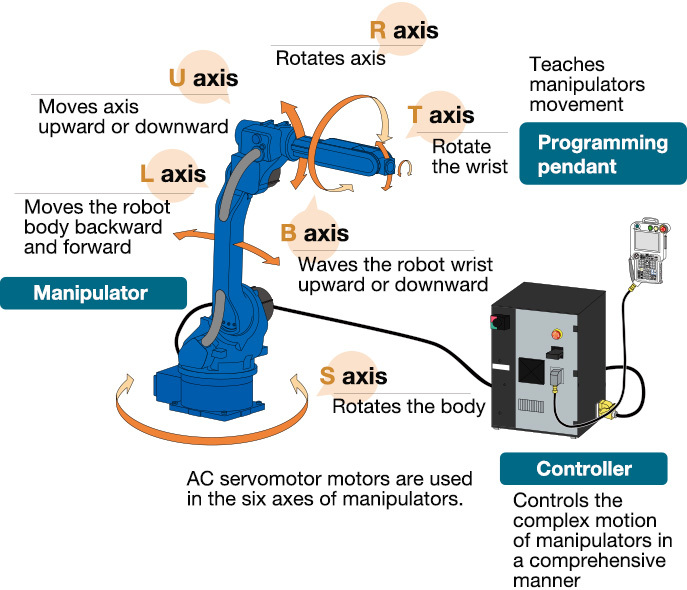 All conventional robots contain of an arm (manipulator) and a computer, which controls the movements of the arm. The arm contains of a highly accurate motor in every junction between two parts of the arm. The motor can turn one part of the arm in relation to the other around an axis, and the number of axis defines the mechanical flexibility of the robot. The definition of a robot states that it has to have at least three axis, which is quite logical to make it able to work freely in a 3-dimensional space. Today most conventional robots have 4 or 6 axis, but robots with 7 axis have been introduced to the market recently to give the robot even more flexibility. The servo-motors in each junction are the mechanical hearts of the robots, so it is quite logical that Yaskawa Electric Corporation, being a world leader in servo-motors and gears, started to manufacture robots in 1977. A good industrial robot has to be extremely accurate in its movements, and this can only be obtained with the most perfect motors and gears. While the robot arm, as such, has been developed and refined over the past decades with more and more axis and better gears, the real jump forward in robot technology has happened on the computer side. The definition of a robot states that it must be programmable, so without the computer the robot does not exist. The processing speed as well and memory capacity of the computers have, since IBM introduced the PC back in 1981, increased with an exponential speed (ref. Moore’s law), and it is this enormous growth in computer performance that has made the recent years’ dramatic development in robot technology possible. The statement that robots are only suited for well defined, simple repetitive tasks was true in the past, but today the modern robots are extremely flexible and can shift from one job to another in a split second, and this opens up for robots performing a lot of new tasks in industries, which in the past could not profit from the use of robots. The increased flexibility has also moved the robots outside the conventional industries and today one finds a lot of robots in the service and defense sectors. These robots are often mobile and are, consequently, called mobile robots.